Our colonial-born brethren are best known here by the name of Currency, in contradistinction to Sterling, or those born in the mother-country. The name was originally given by a facetious pay-master of the seventy-third regiment quartered here, - the pound currency being at that time inferior to the pound sterling. Teale, R 1978, Colonial eve: sources on women in Australia, Oxford University Press, Melbourne, Vic. Although this quote describes a situation in Port Phillip, we can see from the date that it was written eight years before Batman and Fawkner landed. The population of Port Phillip in the 1840s was mostly made up by productive young men aged between 21 and 45 years – in 1841, there were only 53 people over the age of 60. In the years following settlement, there were roughly seven men to every woman. However, by the time gold was discovered in 1851, there were only 148 men to every 100 women – a significant improvement. In the early 1840s, about half the houses in Port Phillip were in Melbourne. 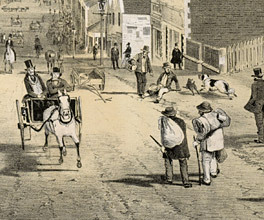 By 1850, this number had dropped to 37 percent, indicating the encouragement settlers were given to develop the bush around the burgeoning city. The houses were small by today's standards, but housed seven to eight people on average. The wretched family of five appeared to have lived on the proceeds of the prostitution of the eldest - a girl who only completed her fourteenth year last September; she was assisted in the prosecution of her infamous calling by her brother, aged eight; and all of them, down to the youngest, aged five, might be seen drunk in the streets at all hours of the night and early morning. Stephen, G 1872, Lecture of home education, The Author, Prahran, Vic. However, following the depression of the early 1840s, the community made efforts to improve the schooling situation. By 1850, Port Phillip had a total of 7,000 children in schools run by churches, government and private institutions. After the depression, education – coupled with massive immigration to Melbourne and surrounding areas during the gold rush – undoubtedly helped rebuild the colony and its population. He was a man of strong opinions, and a central figure in the early years of Port Phillip. This respected figure in Melbourne's history has a past that is fraught with scandal.